With the players offering up a veritable feast of football in Nanjing, enthusiastic fans turned up in droves to lend their support. They witnessed plenty of nail-biting encounters and goals galore, as the men’s and women’s tournaments produced worthy winners in Peru and China. In the women’s football final on Tuesday 26 August, China wasted little time in giving their fans something to cheer about. Playing in front of a partisan crowd inside the Wutaishan Stadium, they thrashed a Venezuela side that had previously impressed in the competition. 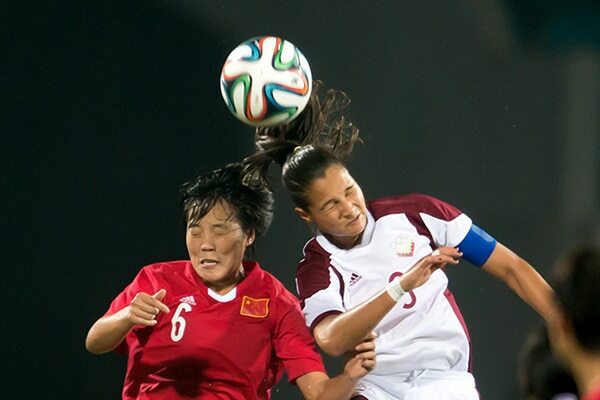 China took the lead through Wan Wenting’s sublime header after just 10 minutes before Xie Qiwen doubled their advantage eight minutes later. Then, despite a brief respite for Venezuela, Ma Ziaolan added a third with a neat flick after 34 minutes to all but seal victory. With the eye-catching partnership of Wang Yanwen and Fang Jie orchestrating the midfield in the second half, Zhang Jiayun and Wu Xi added two further strikes to complete the 5-0 rout. 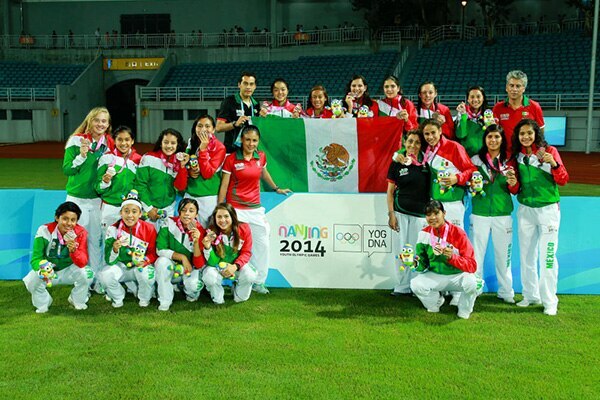 In the women’s bronze medal match, Mexico eased past Slovakia with a 3-1 victory. Things started badly for Slovakia as Andrea Herbrikova bundled past her own goalkeeper early on before Montserrat Hernandez made it 2-0 to Mexico with a sensational volley. After Slovakia got back into the game courtesy of another own goal from Mexico’s Diana Anguiano, Daniela Garcia restored the two goal advantage in the 79th minute to put the match out of reach. Elsewhere, Namibia bowed out of Nanjing with their heads held high. Having suffered 10-0 and 9-0 defeats in the group stages, the African side finished their campaign with a far improved performance and a narrow 3-2 loss to Papua New Guinea in the 5th place play-off. On 27 August, two weeks after football had kicked off the Nanjing 2014 YOG, it brought the curtain down on a hugely successful fortnight of sport as Peru’s men won the Games’ final gold medal, beating the Republic of Korea 2-1. Jeong Wooyeong put the Koreans 1-0 up in a first half that saw both sides miss a succession of clear-cut chances. Franklin Gil then equalised early in the second period before a sublime strike from Peru captain Fernando Pacheco sealed gold. “Our boys are incredibly proud to come all the way from South America and win the gold medal,” said Peru’s Chef de Mission, Alonso De La Guerra. In the bronze medal match, Iceland beat Cape Verde 4-0. After goals from Kolbeinn Finnsson and Torfi Gunnarsson and a Fabio own goal had put them 3-0 up by half time, a strike from forward Helgi Gudjonsson – the European side’s undoubted star – finished off the Africans on 62 minutes. After the match, the players’ interviews reflected just how much the sheer scale of these Games has taken the participating athletes by surprise. An incredible crowd cheered on two Under-15 boys’ matches as if they were watching the Champions League final. On Tuesday 26 August, meanwhile, Honduras beat Vanuatu 5-0 in the play-off for 5th place. 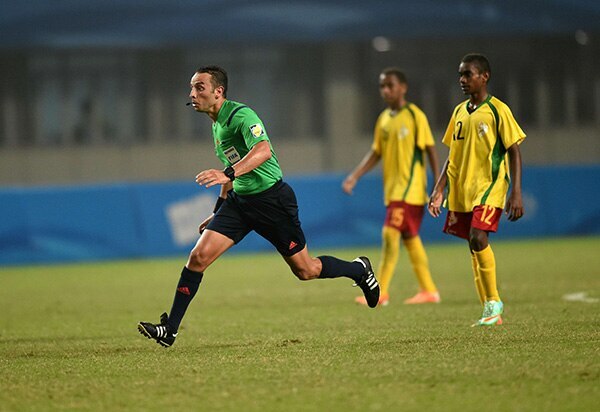 Vanuatu had lost 9-0 to the Republic of Korea and 7-1 to Cape Verde earlier in the competition but the Nanjing Games was still a wonderful experience for the Pacific Islanders. “They have made a lot of friends from places like Brazil and Argentina – countries that produce the footballers they love – and they will leave Nanjing as better people.